Jamie Oliver’s new restaurant in Lisbon was one of the great premieres of the year, and for months the waiting list was huge. Everyone wanted to try the Italian delights of one of the best-known chefs of today. Months have passed, and I decided to try my luck and made dinner reservations in the restaurant that occupied one of the buildings of the so famous Princípe Real. When I arrived at Jamie’s Italian Lisbon people crowded into the bar area, waiting to hear their name being called. At the time I made the reservation — I advise you always doing it — they warned me that the table would only be saved 15′ past the scheduled time. So I was in the belief that there wouldn’t be a significant wait in this restaurant. So it was. My name sounded, and I was soon led to a table upstairs, right in front of the open kitchen. Great! This way I could see all the dynamics behind this restaurant. “Is this your first visit?” We were asked as we climbed the stairs. “Yes, it’s the first time. I was waiting for things to calm down a bit, “I replied, with a childish smile on my face. When seated, we were asked if they could serve us something to drink. I was curious about the sangria we had seen on the bar menu. I insisted that it couldn’t be what we call a pressure wine… I was wrong. “It’s pressure wine, but I assure you it’s delicious. I’ll ask that you be served a small portion to taste, “said the assistant who sat us down. A short time later, the employee brought us a sample and the wine, although from pressure, was of quality and deserved to come to the table. 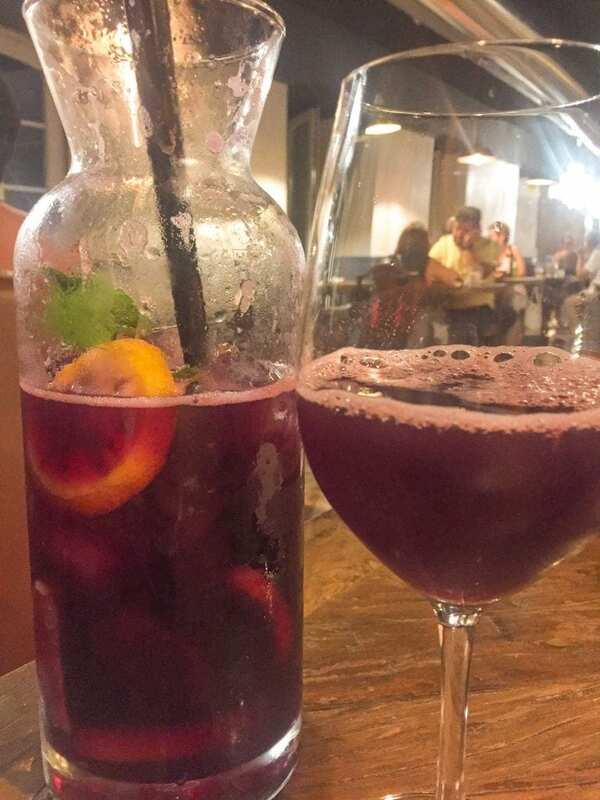 While enjoying good wine, the temperature in the upstairs floor was high, and a fresh sangria came right in handy. Incidentally, the heat was the only big no-no that I have to indicate from this experience. At times, it has even become unpleasant. 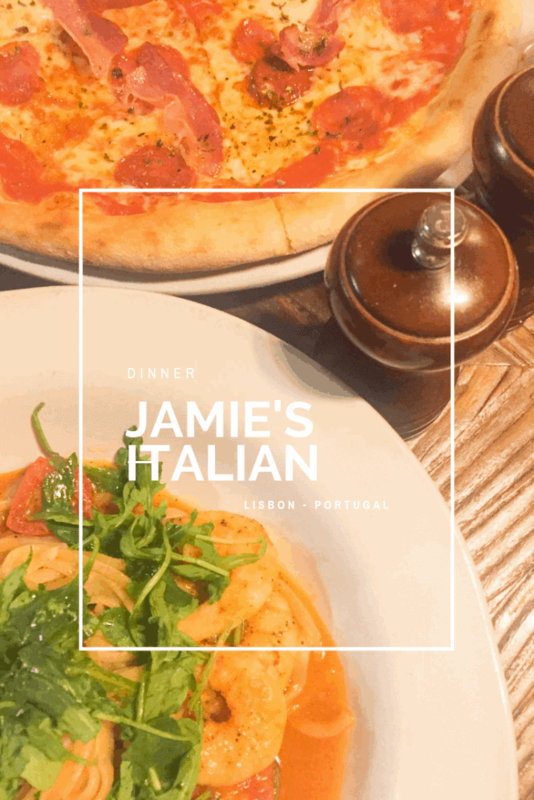 Like any Italian menu, the menu of Jamie’s Italian Lisbon is divided into Antipasti, Pasta, Secondi, and Pizza. Then comes the “Super Food Salads,” so characteristic of the English chef. As antipasta we ordered a crab bruchetta and a porcini arancini. I’ve never been a fan of bruschettas… forgive me my Italian friends, but the ones I had the opportunity to eat were nothing but toast with tomatoes and olive oil. I can say that the crab bruschetta was the best I’ve ever eaten! 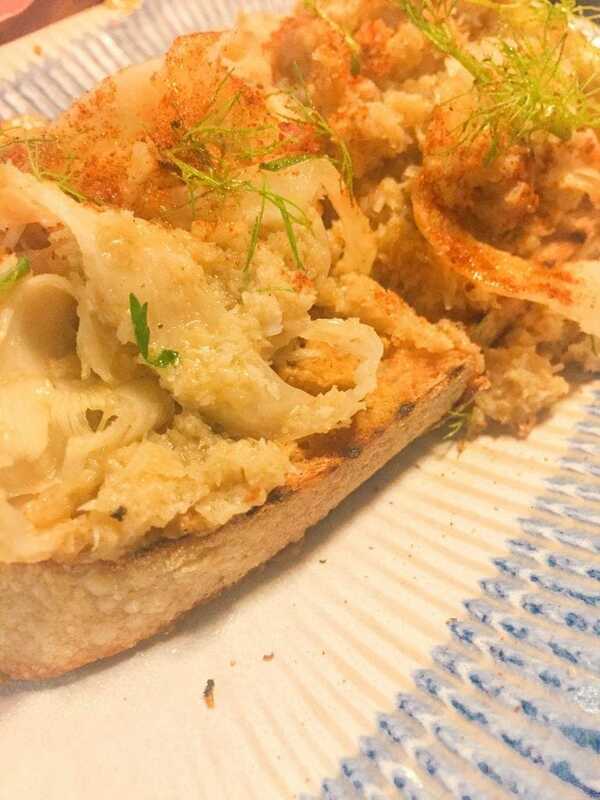 The mixture of the thin slices of crab, with the fennel and the touch of lemon, was perfect. On the porcini arancini, I can only speak well. 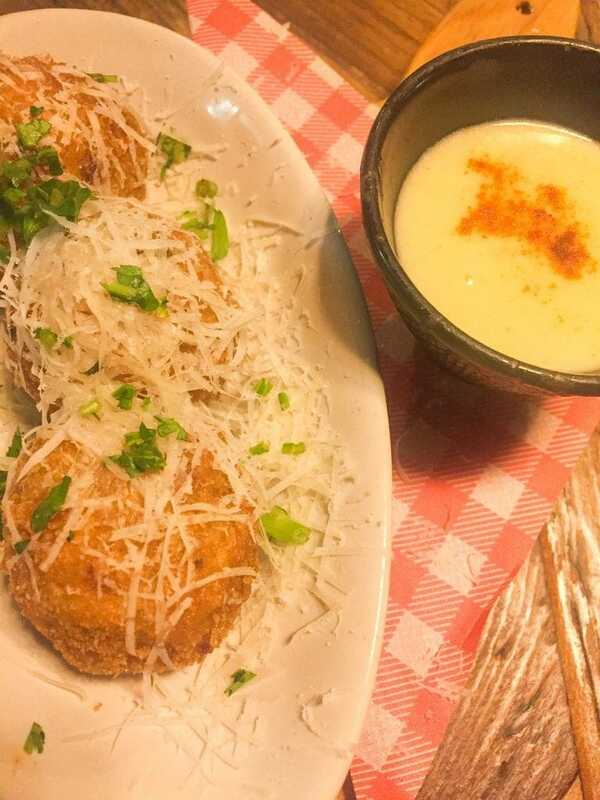 After all, how can you not love small crunchy balls made of mushroom risotto and mozzarella, accompanied by… melted cheese! Cheeseeee! Who can resist? To be able to taste more dishes, we decided to order pasta and a pizza. The first choice of pasta was the crab spaghetti, but unfortunately, we were told it was no longer on the menu… although it was on the list in front of us. A little bit disappointed, I opted for the prawn linguine, a well-known dish by Jamie Oliver, which I have even tried to reproduce at home. Of course, the one that came to the table was very different (much better!) than the one I made. About the pizza, we chose The Carne. Despite the delicious pepperoni and the well-made pizza, I didn’t think it was beyond extraordinary. It’s excellent pizza, but it was not in my top 3 of the best I’ve ever tasted. On desserts, I can’t pronounce. We were quite satisfied with what came to our table, and there was no room for anything else. 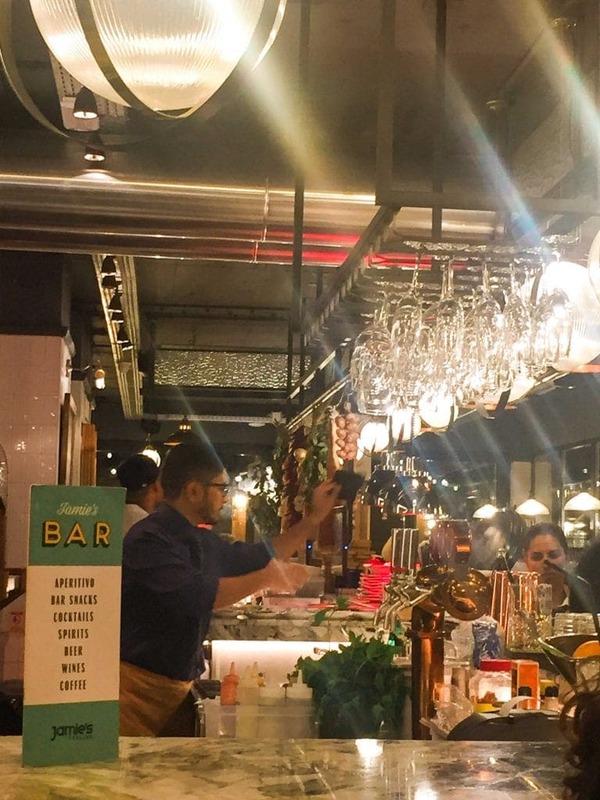 Overall, I really enjoyed Jamie’s Italian Lisbon, the decor, the service and, in general, all the dishes we sampled. An experience to repeat on a day when I fancy good Italian food. 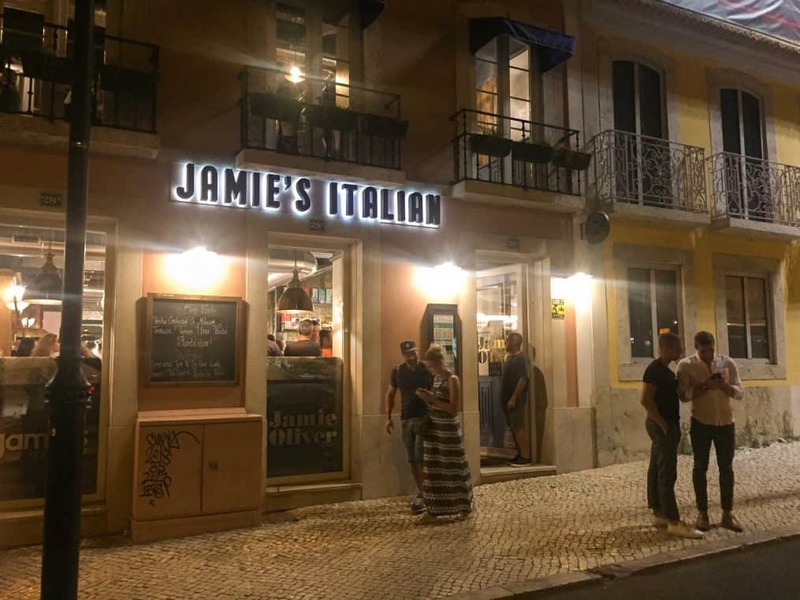 Do you know Jamie’s Italian Lisbon? 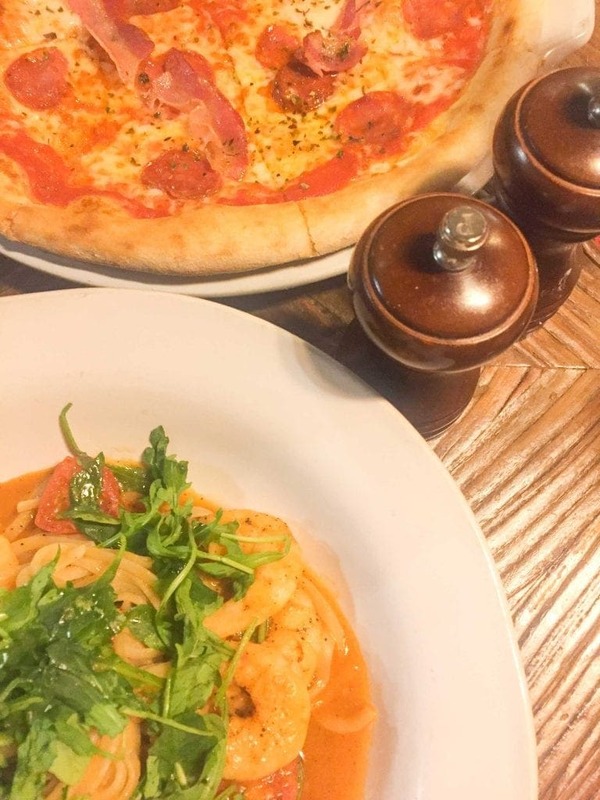 What’s the best Italian restaurant you’ve ever been to? Share your experiences in the comments box below. 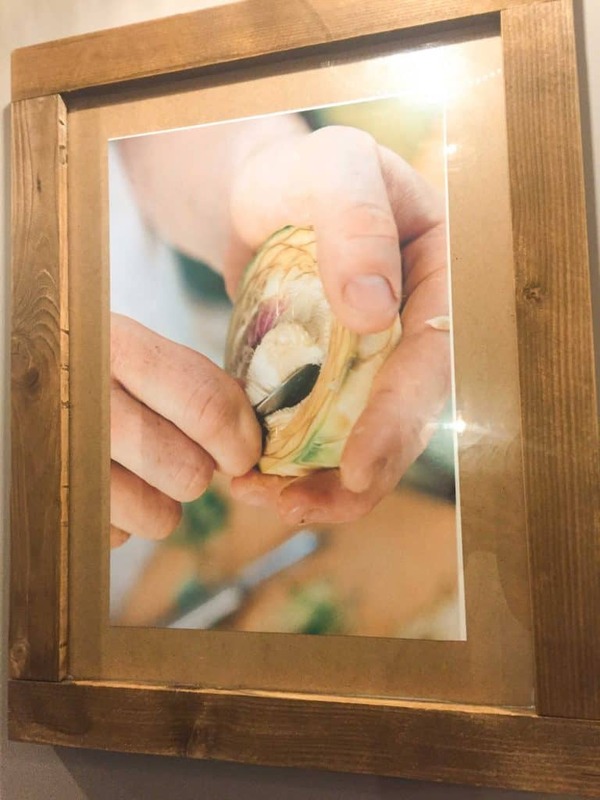 If you like this post or if you want to show the restaurant to someone you know, don’t forget to share it on your social networks. Thanks! That food looks delicious! The place also looks good very cute. Great Post! Thanks, Haley! It was super delicious. 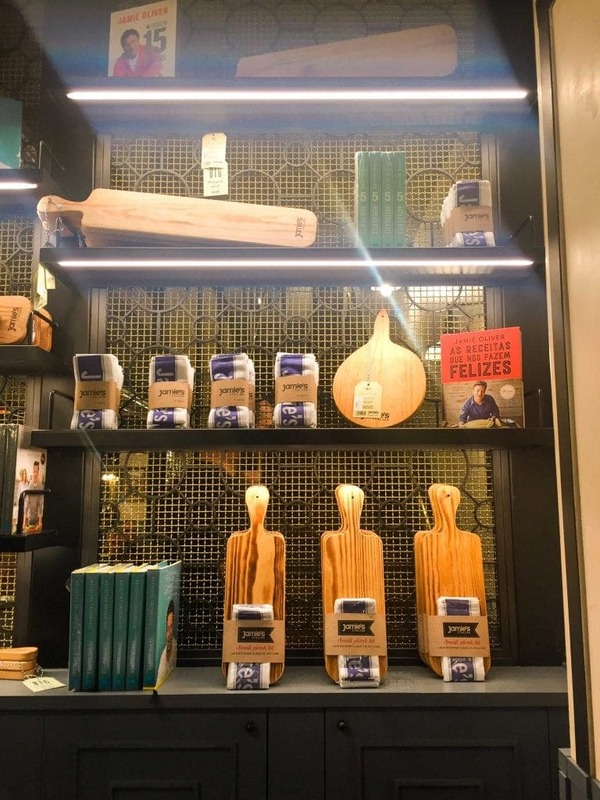 I love that they have little cutting boards on display, they’re so cute. The restaurant was all Jamie Oliver, from the food to the books on the shelves. Super cool!